352 pages, 8.5" x 11"
George Silver's Paradoxes of Defence (1599) and Brief Instructions upon my Paradoxes of Defence (ca. 1605) are probably the most important works ever written on the Western martial tradition. Silver straddles the medieval and Renaissance worlds, summing up the collective experience of centuries of European warcraft, while presenting a fighting style that ensures victory in the urban battlefield of single combat, street brawls and honorable duels. Silver presents a complete integrated fencing system applicable to a wide variety of weapons, but more importantly provides a theoretical framework of universal principles by which to judge any technique, theory or strategy. He teaches how to identify the flaws of any enemy's fighting style, exploit his weaknesses and overcome him while remaining secure and safe, using the traditional "True Fight" of the English knightly class. In addition to presenting Silver's original works, author Paul Wagner and other scholars examine Silver's contributions, putting the Master and his legacy in context. 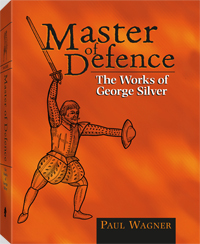 Master of Defence is a necessity for any student of Western fencing or swordsmanship, Western or Asian martial arts, Shakespearean or Renaissance studies, English military history, medieval reenactment or professional fight choreography. Paul Wagner is a founding member of the Stoccata School of Defence (www.stoccata.org ), where he teaches classes and courses on various English weapons – shortsword, sword and buckler, longsword, quarterstaff, backsword and rapier – as well as German sword and buckler and medieval sword and big shield.